The Eurotard Angelica Bow Back Dress includes a trendy bow back, a precious cap sleeve, and an attached skirt. What more could a tiny ballerina ask for? The Angelica is made with a supple microfiber material, wrapping dancers in soft comfort. This piece is basic enough to fit within most studio dress codes, and fashionable enough to draw attention. 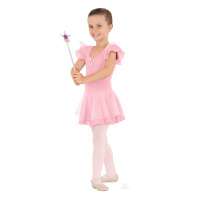 Your little dancer will look and feel like an angel! Available in Child sizes X-Small to Large.